Blackish is the TV series on ABC. A few weeks ago, I watched it for the first time – it is a story of African American family. ABC 방송국에서는 블랙키쉬라는 시트콤을 하는데 몇주 전에 처음으로 볼 기회가 생겼다. 흑인 가정에 대한 이야기다. It was kind of election special. The son was running on the high school election for the student president. And the daughter was applying for the college. 선거 특집 비슷한 거였는데, 주인공 집안의 아들이 고등학교 학생회장 선거에 나섰다. 그리고 딸은 대학에 진학하려고 입학원서는 넣는 중이었다. First of all, the Blackish is comedy and is fun. But that episode made me uncomfortable. The son used white guilt to win the election, showing the slavery pictures in his presentation as if those pictures were accidentally added. 일단, 시트콤, 코메디로서는 재밌다. 그런데 내가 봤던 그 에피소드는 꽤 불편했다. 미국에서는 White Guilt라고 백인죄책감 정도로 번역할 수 있는게 있는데, (백인들이 과거의 노예 제도 등으로 인해 흑인들에게 죄책감을 느끼는 것) 여기 아들이 선거 프레젠테이션에서 과거 노예들의 사진을 실수로 들어간 것 처럼 꾸며서 보여줌으로써 백인 죄책감을 선거에 이용하고 있었다. And the mother was very anxious and worried about her daughter because the grade is not good and she is not going to be able to be admitted to a college. But she daughter also used white guilt in her essay, and the mother found that, she became happy that her daughter would be admitted to good colleges. 그리고 그 집의 엄마는 딸이 공부를 못해서 대학에 못 갈까봐 노심초사하고 있는데, 딸이 에세이에 백인 죄책감을 느끼게 하는 것들을 마구 사용해서 입학원서를 작성하고 있었다. 이를 알게 된 엄마는 딸이 좋은 대학에 가게 생겼다면 좋아한다. Well, I don’t deny that there would be some African Americans using the white guilt unfairly. But we also must admit that there are so many African Americans with ability and capability. But this show depicted that “ALL African Americans” are not able to achieve something by themselves and they have to use white guilt for their success. ABC did not mean it but at least I’ve got that impression, and it is not OK.
흠… 흑인들 중에 백인 죄책감을 부당하게 이용하는 사람이 있다는 사실 자체는 부정하지 않지만, 흑인들 중에도 많은 이들이 능력이 실제로 출중하다는 것 또한 인정해야 한다. 그런데 이 시트콤은 “모든 흑인”들은 스스로는 아무 것도 성취할 능력이 없으며 성공하기 위해서는 백인 죄책감을 이용해야만 한다는 식으로 묘사하고 있다. ABC가 물론 그걸 의도하지 않았을 수도 있지만, 최소한 나는 그러한 느낌을 받았고, 이건 옳지 못하다. Last Sunday, I did some portion of worship service in a huge white church. The church members are mostly white and very rich. One of the things I did was prayer, and I prayed a lot about the church shooting in Charleston, SC because it happened just last week. For your information, any racial issues are not mentioned in that church. 지난 주에 큰 대형 백인 교회에서 예배에 참여해서 일부를 맡아 했다. 이 교회는 성도들이 거의 모두 백인이고 겁나 부자다. 내가 예배에서 했던 것 중 하나가 기도였는데, 지난 주에 발생했던 사우스 캐롤라이나의 찰스톤 총기 사고에 대해 기도했다. 참고로 말하지만, 그 교회에서는 인종에 대한 문제와 사건에 대해서는 완전 함구를 한다는 것이다. What I prayed for was asking God’s forgiveness because we, humans–not God, made racism, sustain the racially unfair system, and excercise hate. 내가 기도했던 것은 하나님께 용서를 구한 것이었다. 왜냐하면 인종차별을 만들고, 차별적이고 불공정한 제도를 지탱하고 미움을 실행하는 것은 하나님이 아니라 우리, 인간들이기 때문이다. After the worship service, couple of people came to me and the prayer was good. And then a gentleman came to me identifying he graduated Princeton seminary 50 years ago. He told me with very firm voice, stressing each and every word, that IT IS NOT A HATE CRIME, IT IS NOT A RACISM ISSUE, BUT IT IS JUST A MENTAL ILLNESS. And he also affirmed that OBAMA BROUGHT HATRED AND UNFAIRNESS INTO AMERICA. 예배 후에 몇몇 사람이 와서 기도가 좋았다고 말했고, 어떤 할아버지가 오더니 자기는 프린스턴 신학교에서 50년 전에 졸업했다고 하면서 한 마디 한 마디 완전 강조하면서 하는 말이 “이 건 증오 범죄가 아니야, 이건 인종차별 문제가 아니야, 이건 그냥 걔가 정신병인 거야.” 그리고 또 또박 또박 강조해서 하는 말이 “오바마가 미국에 미움과 불공정을 가져왔어”라고 했다. 나는 완전 벙 쩠다. 할 말이 없어서 멍하니 있는데, “자네 사역에 축복이 있기를”이라면서 떠났다. Please somebody teach me what to do in case like this. 이런 경우엔 어떻게 해야 하는지 제발 누가 좀 알려줘. If that is just a mental illness, then, let’s put all those people having mental illness (a.k.a. racists) into mental hospital and do not allow them to see the sunshine until their disease is cured completely. 만일 이게 정말 정신병일 뿐이라면 정신병을 가진 모든 사람들 (그러니까 인종차별 주의자)을 모조리 정신병원에 가두고 병이 완전히 다 치료될 때까지 절대 햇빛을 보지 못하게 하자. Before I begin today, I want to add some of yesterday. I sat next to a mother-daughter family from Switzerland in the sharing taxi to Jerusalem. I thought that they were speaking German, so I asked them a few questions. I confirmed that Switzerland has four official languages. I learned that majority speaks German though. The mother told me that their German is different from the German in Germany. They both said that they can understand what Germans say, but Germans do not understand well what they say. They learn German German at school. The mother said that Switzerland has four different German dialects, and the daughter said that her teacher in the class taught that they have twelve different German dialects in their country. So, I got up early in the morning. I asked the lady in the hotel counter where the Lutheran church is. She looked up the map a bit but could not find. She just pointed the Christian quarter and said, “it should be somewhere around here.” I found that Church in the map from the book which theology professor Dr. Cathey borrowed me. The map was not the best detail, so I asked people on the street. In the early in the morning, there was almost no one on the street. The same street feels so different without people. It is people that makes a place lively or dead, holy or defiled, peaceful or turmoil. 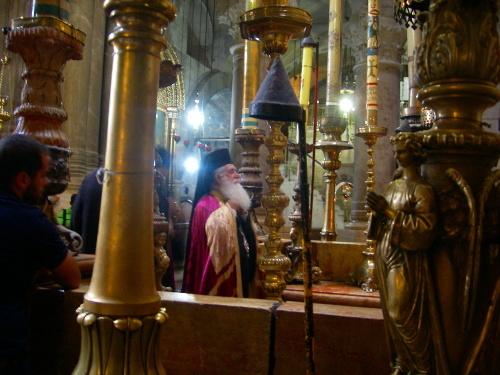 I went to the Holy Sepulchre first. There was some Sunday service was on going. 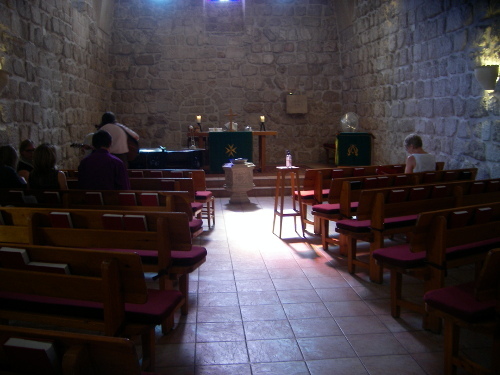 I went inside the tomb place, and tried to stay a little while praying because there were not many people. But clergyman in charge of there tapped the door and asked us to come out quickly. I found the line got so long in just a few seconds. I went to the Lutheran church of our Redeemer to find out that the service is at 9. I had little more than an hour, so I walked to Jewish quarter. 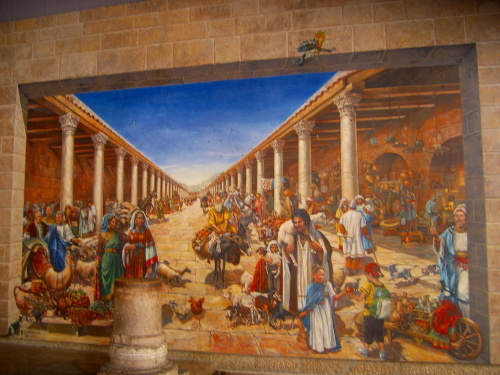 The picture above is Cardo, Byzantine market place, and is market now too. 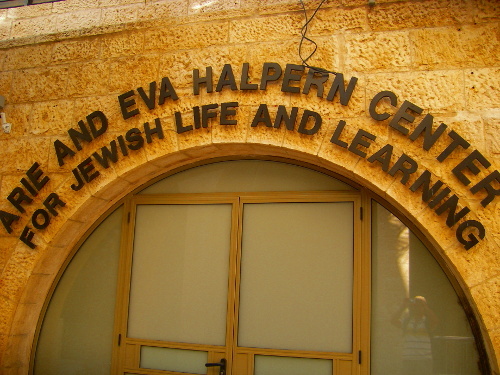 Across the Cardo, there is a centre (there are so many centres in the Jewish quarter), “Arie and Eva Halpern Centre for Jewish Life and Learning.” One thing I like about Jewish is that they value the learning. It looks like being Jewish means continuous lifetime learning. Then I went to the Lutheran church. About 25 people gathered. This is the church that Ted and Paula Hiebert and their children attended for a year while they were living in Jerusalem. The service was OK, not that different from Presbyterians. After the service, I went back to the Jewish quarter right away since nobody talked to me at the church. 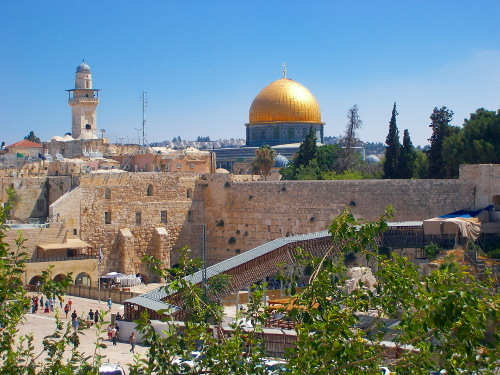 This is the view of the Dome of the Rock, and we can see the Western wall below. I went to the Burnt House Museum. 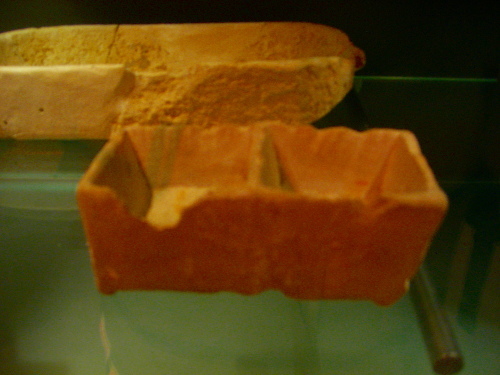 It is the excavated ruin of the house belong to Kathros family. It is considered that the family is the priests. The picture above is one of the founding in the house, and it looks like wasabi bowl in Japanese sushi restaurant. Many things were found in the ruin including the cut bone of a girl’s arm and arrow-head. I can just guess how the battle was when the city was destroyed. In the burnt house I met two Korean girls. One of them are working on M.Div at a full-gospel seminary (I forgot the school name). Back on the street, I was looking at the street map, and a Palestinian old man came and he would show me things (he means guide, I guess). I said, it is OK, and he said ‘just a few shekels, I will show you good things.’ I had only 16 shekels at that time. So I showed it and he took it, then he said, “twenty-dollar more.” And I realised that he is just a cheater, and said that I did not have any money. Then he just left with my money, and I asked him my money back because he was not doing anything worth for the money. He heard me and he ran so fast, disappeared. About the money, I was not lying. I actually had no money with me. So I went to the nearby ATM. I went to archaeological Museum, named “Herodia Quarter.” It is very close to the burnt house, and this museum contains several houses all rich upper class Jewish people 2,000 years ago. 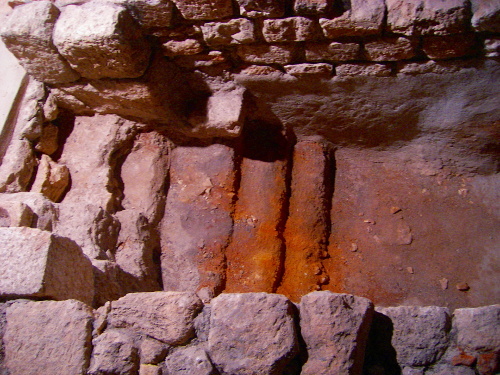 One thing unique about Jewish archaeology is that we find ritual bath wherever we go. Some house has even multiple ritual bathrooms. 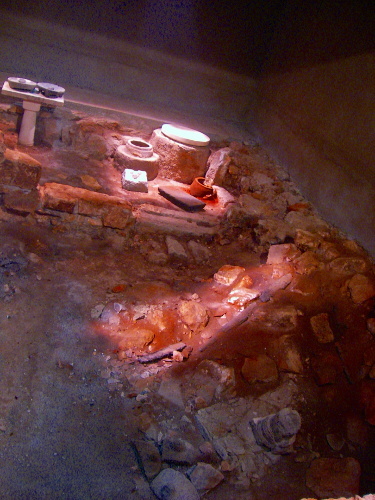 It looks like that ancient Jews only bathed without doing any other things. Then I came out of the underground Museum (both Burnt house and Archaeological Museum are underground, and over the ground are normal building and shops), and ate lunch at Hallelujah, where the McCormick group also ate when we were visiting Jewish Quarter. The burger was so huge! Actually almost where I go, I can recall my memory. There are not many place that I have not yet been to. The local tour guide George Filmon and the Guiding Star literally covered the most out of it. Then I went to the Jaffa gate again, and began to walk down toward the south. My plan was walk through the city wall. Then I found the Ramparts Walk, and paid to enter. The Ramparts walk led me on to the wall. So I walked on the city wall. It was so nice, and had great view. I wondered why Guiding Star did not provide us this one. But soon I realised that it is quite dangerous. 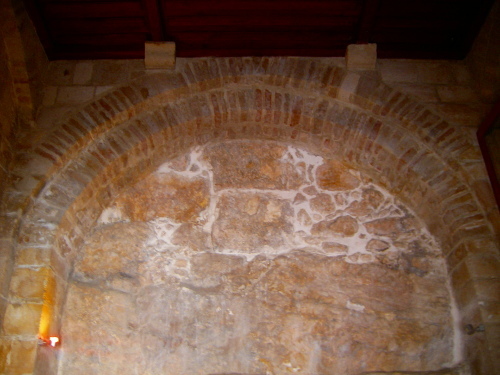 Unlike the picture above, most part of the walk is open one side, and the floor stones are worn and very slippery. Even I did not run at all and walked as carefully as possible. People who travelled with me would know what that means. It is very high on the wall, and anyone who fears the height cannot walk there. So I walked on the wall from near the Jaffa Gate to the Dung Gate. Then I went to the Archaeological Park. It is the down the wall near the dung gate. It is said that it was the royal court and house of Muslim empires. I found one good thing which shows the location of Jerusalem geographically and politically. 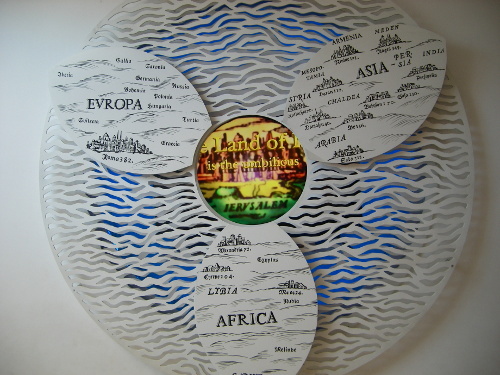 Israel and Jerusalem has been actually the connecting hub of the three continents. 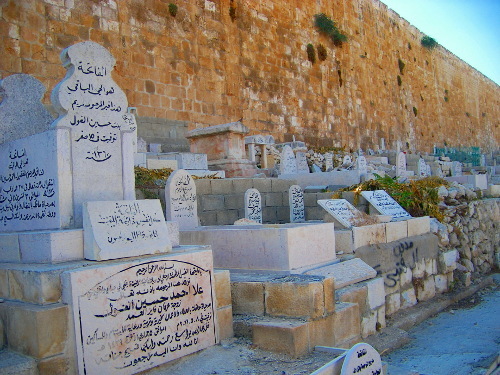 After the archaeological park, I kept walking through the streets, and I went to the Muslim cemetery right below the wall. 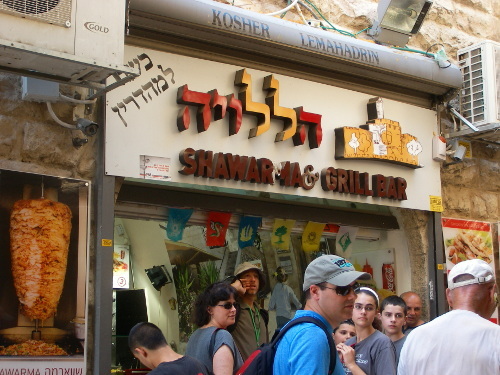 It was quite a walk, and then I met Lion’s Gate where McCormick group used to go to the Haram or Temple Mount. 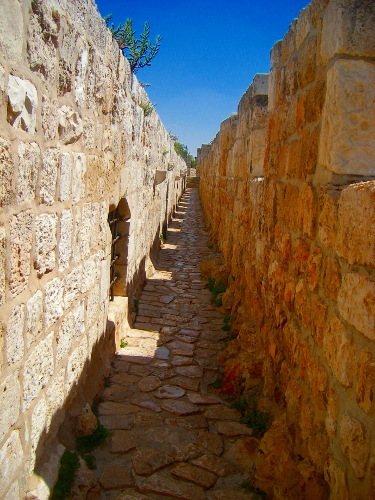 I walked through the road and visited the points of Via Dolorosa again. This is the Ecce Homo point. People thought that Pontius Pilate said “Ecce Homo (Behold the man)” there. 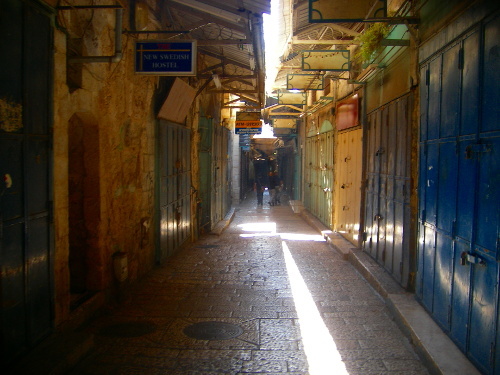 I had two unpleasant experiences in the Muslim Quarter. I guess they are Palestinian muslims because they were at the Muslim quarter. The first thing: Three young Palestinians were sitting side of the road, and when they saw me they asked if I am from Japan. I said I am from Chicago, then a guy said with mocking voice “Ayy Am from Shee-Kay-go.” Another guy also shouted at me, “Welcome to China!” I did not respond further but kept walking. The second thing: A Palestinian young guy asked me, “Hey my friend, come to my shop.” I gently said, “No thank you.” Then he shouted “Chinese” twice and mimicked monkey sounds. I also did not respond at all. So I had three unpleasant experiences today with the Palestinians including the old man in the morning who ran with my 16 shekels, which is about $5. There are many things to say about Jewish – Palestinian relationship, and I believe that the Palestinians must make (international) friends desperately, but they are turning possible friends into enemies. Let me just do some simple calculation. I met two groups (ignoring the old man because he did not do anything about racism), and let me suppose the two group meet so many Asians daily but mock them racially ten Asians. And the two groups 3 in common everyday. Then they together make seventeen Asians unpleasant and turn against them. Seventeen a day is 6,205 a year. They may have short fun time mocking others, but they are actually making more than six thousand Anti-Palestinians annually. They should think what situation they have been in, and are in right now.